Come for the rábanos, stay for the totomoxtle! Come for the rábanos ... stay for the totomoxtle! 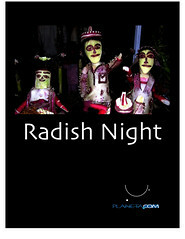 Mexico is known for its colorful, grandiose festivals, but one of the most unique is Radish Night. La Noche de Rábanos is celebrated on December 23rd on the Zócalo and for more than a century has been a focal point of Christmas celebrations in Oaxaca. Combining folk art and agriculture, it is one of the most unique festivals in the world. 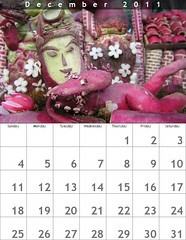 True to its name, the Radish Night festival lasts only a few hours as vegetables have a limited lifespan as folk art. Visitors find ornate radish sculptures, ranging from small animals and human figures to representations of grand events, including the Gueleguetza Dance and Nativity scenes. The Spanish first brought radishes to Mexico in the 16th century. Some historians mention garden contests during Colonial times. The Dominican friars planted vegetable gardens for the young community of Antequera, now Oaxaca City. In 1563 by an ordinance of the Viceroy, the lands near the Noria and Cinco Señores ranches were turned into a village called Trinidad de las Huertas. Legend tells of two Spanish friars who encouraged the local indigenous population to cultivate produce in the lowlands irrigated by the Atoyac River. One of the monks suggested that the farmers carve radishes into imaginative shapes as a means to entice people to buy produce at the market. The tradition of displaying carved radishes may have originated in the Christmas Vigil market held on the 23rd of December. Three centuries later records show that the Mayor of Oaxaca, Francisco Vasconcelos Flores formalized the exhibition of Christmas-inspired horticulture in 1897 at the Zócalo. The event has been celebrated each year ever since. 2011 marks the 113th event, making this one of Mexico's most storied fairs. Today, the radishes are cultivated near El Tequio Park next to the city's airport. The harvest takes place around December 18th. The radishes are delivered to the artisans, who have a few days to produce their complex figures. Some of the radishes can grow to 50 centimeters in length. These giant vegetables are heavily fertilized, treated with chemicals and are not for consumption. In addition to the displays of radishes, artisans compete in two other categories, using dried flowers (flor inmortal) and corn husks (totomoxtle). The grand prize in the carved radish competition is $13,000 pesos ($1,300 U.S.). Radishes (Raphanus sativus L) are native to China. Spanish colonists brought the vegetable to Mexico and radishes were cultivated south of town in the Trinidad de Las Huertas neighborhood. You can retrace the historic steps by visiting the Trinidad de las Huertas Church. If you are buying radishes in a market, the veggies are sold in bunches with their tops on, which helps keep them fresh.